Ashley Judd shops at the Old Farm Market, how about you? I’ve been on the lookout for a produce stand or market in Hendricks County that reminds me of places my family would stop on vacation. I adore those charming roadside stands just off the highway on the way to Florida. For us, it didn’t matter if it was on the way to our destination or coming home. We needed to stretch our legs a bit and grab a healthy snack. Sometimes we’d stop at the stands and buy apples, peaches, or whatever fruits or vegetables were in season. We’d even buy souvenirs, like salsas, salad dressing or any kind of product we didn’t have back home. It’s like bringing a piece of vacation back with you. So let’s talk about this gem of a place in Avon, Indiana, that reminds me of those roadside stands. It’s called Old Farm Market. I actually found out about Old Farm Market from Twitter. I’m a fan of the Indianapolis 500, and Ashley Judd, actress and wife of Indy 500 winner Dario Franchitti, tweeted that she visits Old Farm Market in Speedway to pick up produce while she’s in town for the race. I had never heard of this market, so I did an Internet search and found out about a second Old Farm Market location in Hendricks County. So, I had to check it out. I’ve been to Old Farm Market twice in the past two weeks. It’s just the place I was looking for. It’s a large store, part produce market with a sizeable garden center/nursery and is conveniently located on U.S. 36 in Avon, just a few miles from I-465. Perfect! There’s plenty of parking, which I always appreciate, and outside the store there are a lot of gorgeous plants and flowers and a few bins of watermelon. The outside displays made me want to see the entire store. On my last visit, I decided to stop in the nursery/garden side first to get a few ideas and some inspiration for flowers and plants to add to my backyard. There are several varieties of plants and flowers and anything and everything to make your garden complete, such as decorative flags, stones, statues and fountains. With so many options, making my choice was difficult, but I finally settled on a large red geranium for my backyard. I ventured over to the produce side of the store where there were all sorts of fresh fruits and vegetables, breads, frozen items (like pie and frozen fruits), packaged items (salsas, salad dressing, Amish noodles) and a giant wall of hot sauce. 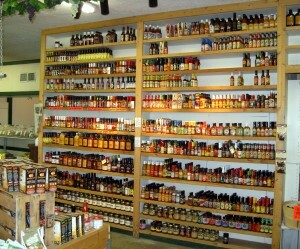 Yep, lots of hot sauces. So what did I buy? I purchased two quarts of Indiana strawberries, Indiana asparagus, a few Georgia peaches and a cobbler mix. Over the last week, I’ve made a few things with my haul, including a delightful strawberry shortcake and peach cobbler. And, the red geranium plant I purchased? It looks positively lovely sitting next to the hummingbird feeders in my backyard. I’ve been telling my family to stop at Old Farm Market because I know it’s what they’ll love, part nostalgia with fresh produce, lovely and well-maintained plants and flowers and a super-friendly staff. 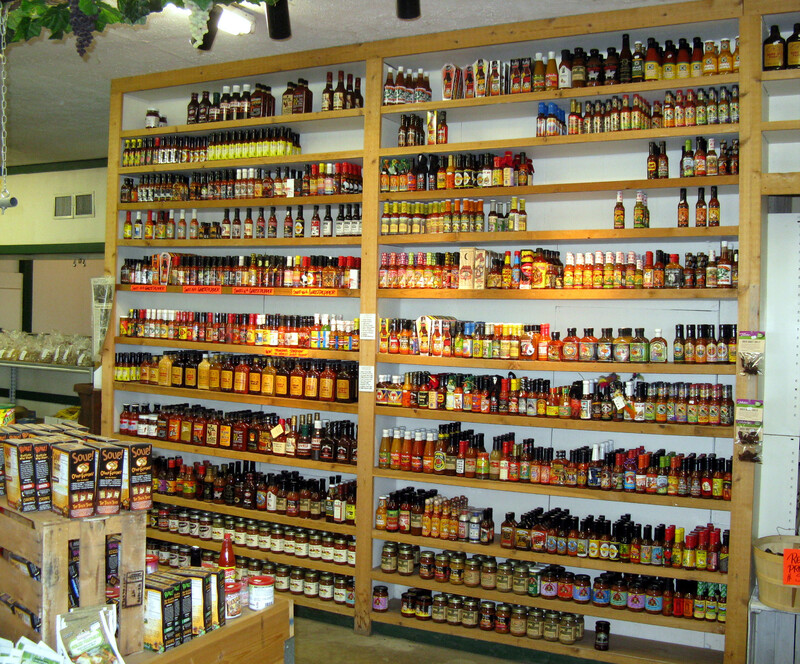 In fact, I’m thinking of more reasons I need to stop at Old Farm Market, like to try out some of those hot sauces. I’m ready for something spicy! 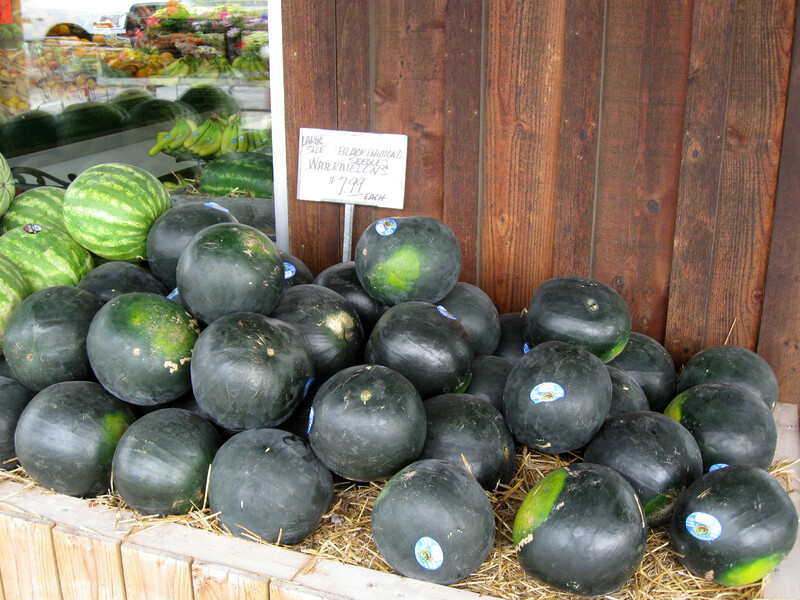 Information: Old Farm Market, Avon, 9613 E. U.S. Highway 36, phone (317) 271-3447. What’s your favorite thing to buy at a produce/garden store? Please use the comment section to let me know what other produce stands or markets I should visit in Hendricks County.